Izmir is Istanbul’s chill cousin known for its café culture and general laid-back attitude towards life. This scenic Aegean city is known for its ideal climate, where the winters are mild and the summers are dry and hot; making it perfect for sitting outside, eating platters of fresh seafood, and drinking ice cold Efes (a popular Turkish beer). Here are the Izmir restaurants that should be on your list. A 24-hour restaurant that serves up delicious pide at all hours. Depending on the time, you will see a wide cast of characters grabbing a late night bite: from a bride and groom after their wedding to families snacking on pide. There are other dishes like kebabs available, but the pide is where is at including vegetarian options like spinach and cheese. Try the kunefe, a traditional Turkish dessert with dough, cheese, and sugar-based syrup. There are many branches around the city, including a spacious one in Alsancak. This bustling restaurant in the heart of Bostanli is one of my favorite restaurants in the city. It has been serving complementary cheesy bread and an assortment of kebabs (try the kofte) since 1965 in a scenic outdoor setting. The efficient and extra attentive service is the cherry on the top-they charged Mustafa’s card twice and when we went back the next day they had a bundle of cash waiting for him-down to the exact cent. It is open 24 hours, so it makes a great stop after the bars for a steaming bowl of corba (soup) before heading home. For an assortment of delicious lokum (Turkish delights), this is the spot to go for sweet treats. A personal favorite is the rose flavored. Do as the Turks do and stock up on nuts and dried fruit in bulk that serve as healthy snacks that go along with tea. There are also spices, roasted coffee, and boxed treats in the form of nuts and lokum, that make a great gift to bring back to your friends and family at home. There are many branches around the city, including one in Konak. This cartoon-centric restaurant is a great casual spot to grab lunch or dinner. Decorated after the political cartoon publication Leman Kultur, there is no shortage of cheeky touches from the novel-sized menu to its quirky décor. The food is not high-end-think an offering of global cuisine (Mexican, Italian, American) and as well as traditional Turkish dishes with a modern twist, but it’s worth just going for the atmosphere. Beer, wine and cocktails are available. There are several branches around the city, including locations in Asancak, and Bostanli. This beloved Turkish cafe is where all your dessert dreams come true. Dessert is taken so seriously, that there are several menus filled with an overwhelming amount of decadent cakes, hot/cold drinks, ice cream and other desserts. There are also traditional Turkish desserts as well as strong cups of Turkish coffee and tea. They have good Turkish breakfast offerings, sandwiches, soups, and salads for those who want something savory. There are a few branches around the city, including one in Alsancak. There are a few branches of this coffee shop, but my favorite is in Konak, which is central, and spacious with plenty of indoor and outdoor seating. This branch has a great selection of drinks, small bites, and a wide selection of desserts. Grab a strong Turkish coffee and find a seat among the international business clientele that are staying in one of the many nearby luxury hotels. There are also chocolate covered nuts and other pre-packaged treats that are worth picking up on your way out. If you are craving beef beyond the typical kebab and are near the Agora shopping mall in Balcova, this is a great fast food option that is a step up from the usual mall burger joint. The interior is inviting and the ingredients are high quality, homemade, and delicious. They have inventive flavors like the Mexican burger with hot sauce and a healthier FitFun burger piled high with veggies. There are also salad options for a healthy side. My all-time favorite is the garlic mushroom burger with a side of potato wedges and plenty of ketchup. I didn’t know about this baklava shop until my most recent trip, and realized I was seriously missing out. The shop specializes in baklava and it is made with real sugar (instead of the fake sweeteners) so it has an addictive caramel flavor. It’s a simple shop, with several different mouth-watering flavors displayed in the window and behind the glass inside. The prices are higher than other bakeries, but worth every bite. It’s located a bit further away from the city center in Cigli, but worth a stop if you’re in the area. A great alternative to the more touristy spots in Asancak, this is a traditional meyhane down a quiet side street where you can get Turkish meze and high-quality meat (think big juicy steaks) and fresh local fish. This restaurant feels more like eating at someone’s home where the raki (local liquor) is flowing freely. There’s no menu and hardly any English is spoken, but you just need to trust everything they suggest will be delicious. If you want to treat yourself, this long-time seafood restaurant in the heart of Asancak is the place to go for a fancy night out on the town. Expect elegant seaside dining, top-notch service, and all guests on their best behavior. 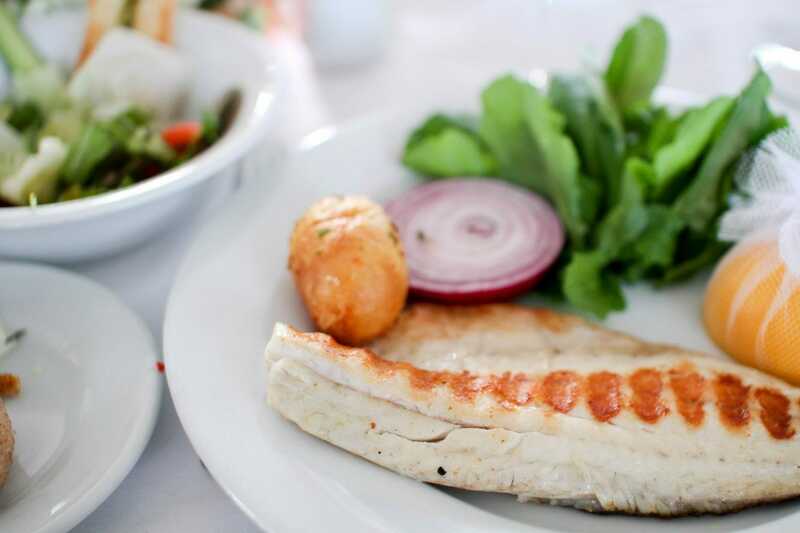 Highlights from the menu include an array of delicious mezes and seasonal fishes from the nearby Aegean Sea and Black Sea. Go on the weekday to avoid waiting for a table. What are your favorite Izmir restaurants?